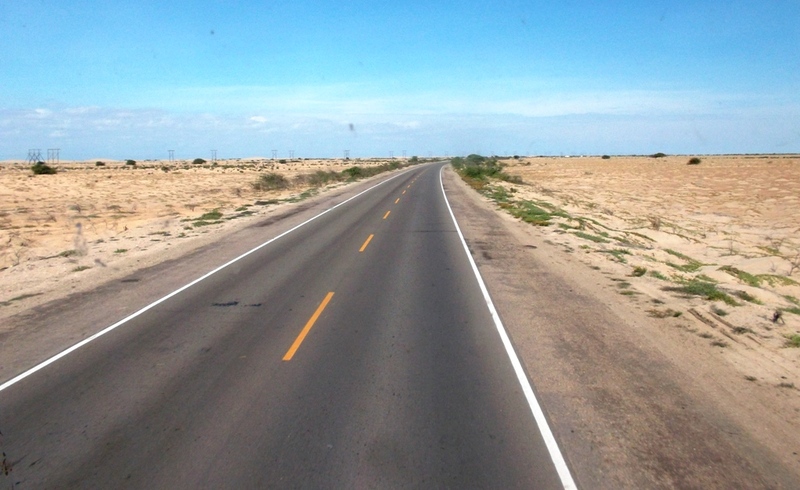 While inquiring around about a bus to Chiclayo I was interrupted by a tall and slim Arizonian who insisted on helping me out. 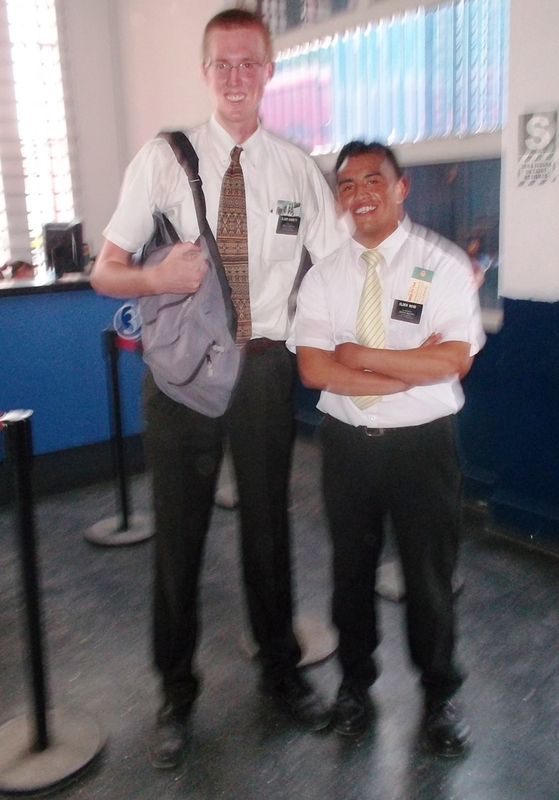 He said this as his missionary partner, a young Peruvian man, started flagging down taxis inquiring about the best place to go to get a bus to Chiclayo. In about a minute, the three of us were in a taxi. During the six or seven minute taxi ride, I shot the breeze with the north American. I was surprised that he didn’t bring up religion. We were out of the cab. As I was pulling money out, the Peruvian missionary told me that he had covered the fare. They accompanied me into the station where I bought a 13 Sol or $4.90 bus ticket for the three-hour ride to Chiclayo where my double-decker bus would be off in five minute’s time. I ended up sharing the top front of the bus with a Peace Corps volunteer from New York City. We shot the breeze, mostly about Perú where I’d only been for a few days. He was able to provide a lot of information. Early that day I’d tried to find accommodation in Chiclayo but wasn’t able to find anything cheap online. Fortunately for me, the Peace Corp volunteer mentioned that I could accompany him to Hostal Amigos, the place where all the peace corps volunteers stay when they come into the city. He told me that the cost is 40 soles or $15 and has all amenities including what might be the hottest water in Perú. I didn’t have to think. I only had to take a seven or eight-minute walk with this Chiclayo veteran. When we arrived, the sign and woman said 50 soles. I mentioned that I was told 40. Without a flicker of a thought, she kindly gave me their peace corps rate of 40 soles. After lying down in a super comfy bed with ultra clean sheets, I thought while drifting away: Traveling can be an easy endeavor when random, altruistic luck comes your way. I went on to ponder: It’s great to accept these helpful deeds as this is how members of the human race should treat one another. Next time I have the ability to help someone out, I’ll think of the Peruvian and north American missionary, of the ticket agent who gave me a VIP seat, of the peace corps volunteer, and of the woman who didn’t have to give me the discounted hotel rate but did anyway. Have you had any strangers go out of their way to help you or vice-versa? Feel free to comment below. Remember the movie “pay it forward” with Kevin Spacey -same idea, right? Anyway, the ride with the panoramic view of the countryside must have been awesome. looking forward to more postings from Peru. There are many decent people in this world. As I sit and watch the BBC news in the morning, it seems like there are so many negative things happening in the world. If we all could help each other then the world would be an even better place. I wish all travelers safe journeys and more happy encounters! MAMMA: I’ve been a bit of a news resister as of late. The news is mostly negative. I could have it on in Spanish as I write this. It’s great for improving vocab and fluency. However, I’m going to bed soon and would prefer to relax as opposed to take in all of the negative things that are being spewed out. It’s not healthy for my mindset. The world is surely a great place. People do help each other a lot. It just doesn’t make for exciting news so you don’t get to see it very often. As the manager of my bank at a branch here in VT, who happens to also enjoy utilizing her business contacts to help connect jobseekers with available jobs, told me yesterday when I walked in and happened to end up chatting with her: there are no accidents. ADIRONDACKER: Not sure if I believe in that fate thing. I think that the occurences in the above post all happened by chance. Not sure if I trust the cosmic credibility of a bank manager/headhunter. 🙂 but ’twas interesting that she said that nonetheless. I agree. One great thing about traveling are the random people you meet along the way. Nothing surprises me anymore because you never know who you’ll come across at any instant.